In this beautifully written book, acclaimed Scripture scholar Fr. 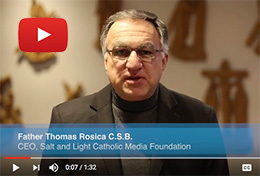 Thomas Rosica offers reflections on the words of Jesus as he died on the cross. Interwoven with inspiration from St. Teresa of Calcutta, Pope Francis, Pope Benedict, and Pope John Paul I, these profound reflections invite us to consider our own frailties, fear of death, and thirst for justice in a modern world. Note that this book can only be sold within the United States. We ask our Canadian friends to order directly from Novalis.